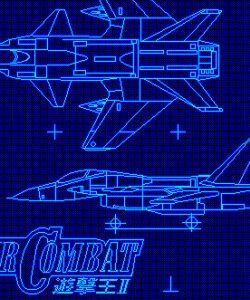 Air Combat Yugeki-oh II was developed by SystemSoft for the NEC PC-9801 series of PC's in Japan. The package contained a 30 page manual and 2 floppy disks. The two floppy drives are necessary to play as it is impossible to install on the Hard Drive. Screen resolution was 640 x 400 pixels and 16 colors. There was a cockpit view only, no external view, and a special mode called the wired scan system for night missions.